Asbury Park lost one of its most iconic business owners on Sat., Dec. 5 with the death of well-known local photographer who had his business in the city for more than 60 years. Ed Noumair, 94, died peacefully in his Lincroft home. Born in Brooklyn in 1921, Edward George Noumair started his business in Asbury Park in 1939 after he graduated from Asbury Park High School. He remained in the city for more than 60 years except for a tour with the Marines during World War II. And almost everybody knew Ed Noumair, especially for his portrait photography. John Villapiano, a former state Assemblyman and the owner of Seashore Day Camp in Long Branch, said Noumair was the staff photographer at the camp since 1945. “Ed came every year, through thick and thin as hot as it sometimes was. He was just a phenomenal guy. He was a gentle, caring person. And we called him ‘One Shot Ed’ because he always got the picture right the first time,” he said. Villapiano said that 2015 was the first year Noumair could not make it to the summer camp due to health issues. “But he wanted to come in the worst way. Ed would take candid shots and take his him time and walk around. He was just a terrific person and Ed believed in fairness and was a political activist. He was always there for me and I can’t tell you how upset I am over this,” he said. Coaster File Photo – Ed Noumair, a well-known and popular photographer in the Asbury Park area, died Sat., Dec. 5. Historian Helen-Chantal Pike said that she found Noumair to be very interesting for “different reasons” when she was researching her book “Asbury Park’s Glory Days” [Rutgers University Press, 2005]; where she writes about Noumair. “First, I found Ed interesting because he was from a tiny Lebanese community in Asbury Park- a group that I wanted to know more about. His family worked to the point of achieving the American Dream,” Pike said earlier this week. “Plus one of his very earliest jobs was working for Walter Reade,” she said. Noumair was hired by movie theatre magnate Walter Reade to promote movies and to film and broadcast local high school football games on Reade’s TV. Pike said she first met Noumair as a child while attending Oakhurst Country Day Camp during summers. “He would come and take everybody’s picture by age groups,” she said. And that is probably how many people remember Noumair. He worked as the Asbury Park High School Yearbook photographer until 1999 when he closed his final location on Bangs Avenue. It was not uncommon for people to stop Noumair on the street and tell him he photographed their wedding, their anniversary party, or a first portrait. His studio included custom portraits, weddings and commercial work. During World War II, Noumair shut down his studio and joined the Marines. While on duty, he was trained to take aerial photographs. Upon his return from the war, he reopened his studio and continued his work with portraits. 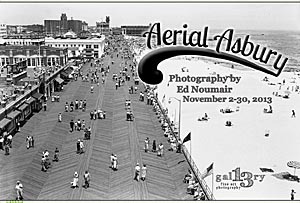 In 2013, an exhibit of Noumair’s aerial photographs of Asbury Park, taken just after the war, was held at a downtown gallery. “In terms of reaching a lot of people, that is where his name-brand recognition lies. But only in part. His aerial photographs are amazing pieces and we would not have them if not for Ed experimenting with aerial photography,” she said. “Ed was in a lot of different places (but) the body of his work is a lot bigger than that he just took everybody’s portraits,” she said. Pike said was glad to see that Noumair lived long enough to see Asbury Park coming back. “Ed saw all of these changes in Asbury Park over many years and he lived to finally see the city he loved come back. And I think that is a wonderful thing and he is an important part of Asbury Park history,” she said. While at Asbury Park High School, Noumair joined a photography club and the teacher encouraged and supported his interest. His work became increasingly popular at school so he was eventually asked to photograph various school projects, including individual students. During the summers, he worked at a concession on the Asbury Park boardwalk, called The Action Photo Company. He was given a DeVry Motion Picture camera and would take photos of people, three at a time. A card with numbers on it corresponding to the photos would come out of the camera. That card would then be given to the potential customers and they could then contact the studio and order the three photos for the price of a quarter. Noumair was a past president and an award-winning member of the Professional Photographers Association of New Jersey. He also taught photographic composition and technique one day a week at The Rugby School in Woodfield.